G.S. DUNHAM has been, and remains, the NYC metropolitan area’s leading innovator for steam heating systems, products and services. We are the region’s exclusive manufacturer’s representatives for MEPCO (formerly Dunham Bush),VentRite®, the industry pioneers in the design and manufacture of steam and hydronic heating systems, and ELGE® High Efficiency Heat Exchangers. G.S. 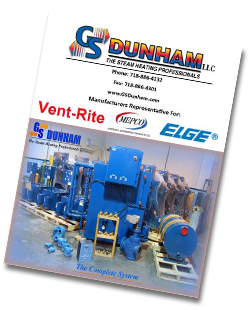 DUNHAM combines state-of-the-art products from MEPCO, VentRite®, and ELGE® with expert service and support. As a fully authorized service and sales company, we thoroughly understand the inter-relatedness of engineered steam components. Our specialty is system efficiency and occupant comfort. We bring an electrical and electronic computer background along with over 100 years of experience to your building. Our latest controls offer internet based monitoring and control including all of the old familiar Vari-Vac® functions plus modern apartment temperature monitoring including data history reports. No job is too large or too small, whether your need is for a retrofit, modernization, service for an existing system, or assistance with a new install. Our crews are available for emergencies and are well-equipped to handle both common and unusual problems. At G.S. DUNHAM we work with contractors, engineers, Co-op and Condo Boards, management service companies, building owners, resident managers, wholesalers, and superintendents. And our services, equipment, and parts are top-quality and competitively priced. G.S. DUNHAM is centrally located in Western Queens to effectively serve all five boroughs and Northern New Jersey. Our facility has a full inventory of parts as well as a machine/motor shop. We offer operator instruction, available either at your site, or in our own classroom. G.S. DUNHAM’s commitment to superior products and service makes us your turn-key solution for all your steam heating needs including hands on steam trap testing and repair with real steam. Call (718) 886-4232 today or Contact Us online.